Beyond the functional aspect of a mat keeping the art away from the glass, there's a function to the aesthetic as well; giving enough negative space for the eye to rest so the art can be the focus as it hangs on the wall. If one is to err on the width of the mat design, it would be safer to make the mat width too big as opposed to too small. There are variables though. The size and composition of the art and the broadness of the frame are factors to consider when deciding the mat width. One rule of thumb is to make the mat measurement differ noticeably from the size of the face of the frame. The designers at Atelier Rosal can discuss your options once the work and samples have been chosen. As a custom frame shop, the tendency is to keep mat borders equal on the top, bottom and sides with a few exceptions. One exception is fitting art into an existing frame. In the above photo, there are three sketches depicting varying mat widths on the same "work of art". The bottom left sketch shows the art with an even border (somewhat "even" - pardon the free hand illustration). The balance of this design allows the viewer to see the art "as is"; as the artist intended to present his or her composition. This is easily done with custom framing or if the art has the same ratio as a ready made frame (e.g. with a 4:5 ratio a 16x20 image would fit into a 20x24 standard sized frame and have equal mat widths all around). But there are times when an artist or collector has an existing frame for a work on paper that aren't the same ratios, forcing the mat dimensions to be unequal. The top two sketches illustrate uneven borders where the mat width is wider on the sides than the top and bottom (left sketch) and where it is wider on top and bottom than the sides of the mat (sketch on top right). The left sketch, with the thinner top and bottom borders, makes the image feel compressed or "squished" as one reader noted. The larger side borders also act as a negative space that draws your eye away from the image. Conversely, the uneven borders in the sketch on the top right somehow support and reinforce the strong vertical composition of the art. Despite the borders being larger top and bottom, the focus remains on the image. In both instances, this is due to the cultural influence of reading left to right which influences our "eye flow" as we view text and imagery. The primary reason, in terms of aesthetics, for matting and framing is to keep the eye focused on the art and the integral components of the composition. Art appeals to viewers with visual sensibilities. A strong visual presentation with good design allows the image to communicate to that audience. At Atelier Rosal, we consider ourselves the "caretakers of art". Good framing is about what's inside the frame supporting your work, as well as the aesthetic of the frame design. 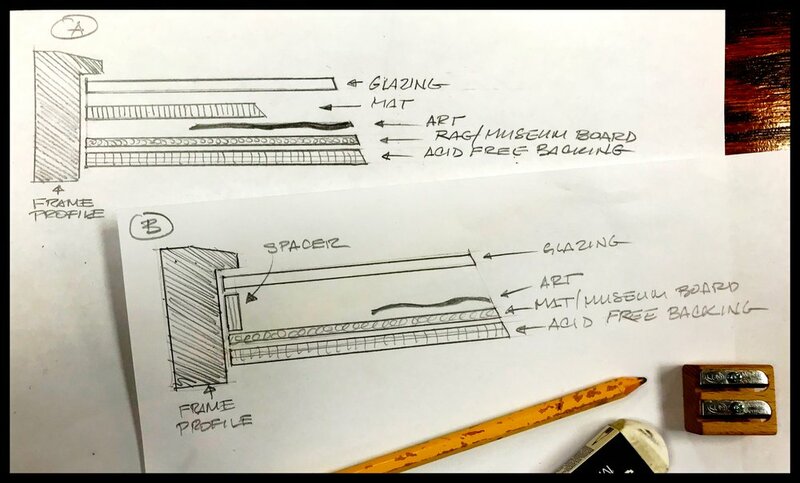 Traditional approaches to framing (acid free mats, backing and UV glass) give your precious works a better chance of longevity. While other display designs (floating art on a board, plexiglass face mounting) are aesthetically pleasing, it should be taken into consideration the value and collectability of the art as well as the need for conservation. All of this can be assessed when the art comes in for us to inspect. 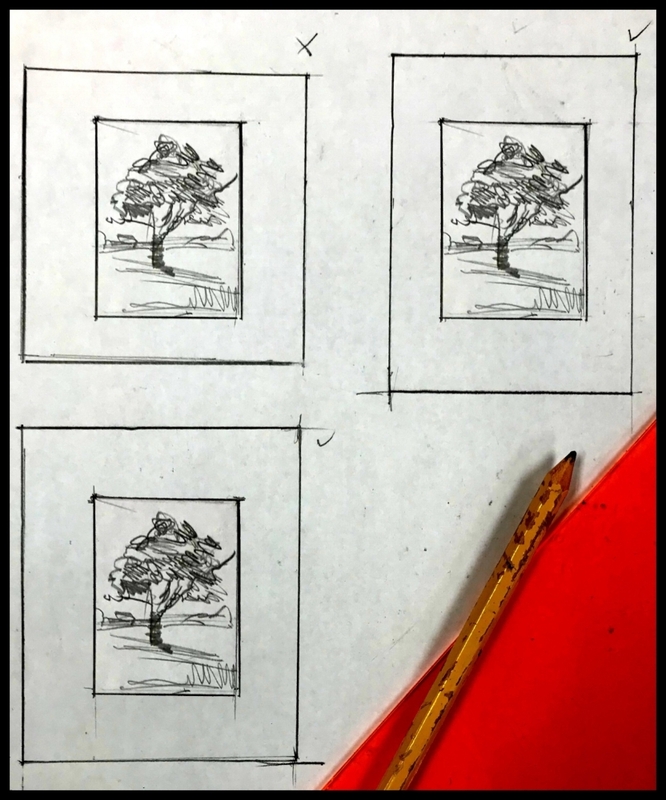 In general, we recommend the above frame designs (illustration "A" and "B" in the preceding photo) and their variations for framing of basic works on paper. The best practice is to keep glass off of art. The mat (illustration A) is more than a design aesthetic, but functions as a spacer between the art and glass. In illustration "B", art floating on a board can be distanced from the glass by the use of a spacer attached to the frame. Being that paper is an organic material, environmental changes (temperature, humidity, etc.) may affect the art that is touching glass as the glazing acts as a conductant. Traditional photographs with emulsion surfaces are particularly susceptible to damage when pressed against glazing, but the variables within the artist's medium, application of the medium and paper quality can have undesirable effects with other kinds of art as well. Again, Atelier Rosal will inspect your work and give you options and recommendations on how to best conserve and frame your work.